» Forum » Tech » Tech: Generic » I'm new to pinball repair and the forum. Please help! » I'm new to pinball repair and the forum. Please help! I'm new to pinball repair and the forum. Please help! Auto launcher isn't strong enough to always get the ball in the play field. Flippers are a little weak. After I make a goal on the game, the ball has issues getting back up into the play field. I'm unsure of what that piece is called. Auto kicker? Ball return? Ball has trouble making the ramps, any recommendations on leveling this game? Do I need coil sleeves or new coils? Flipper rebuild? I'd appreciate any advice you could give. Thank you very much. Where do you live? If you are near So Cal you can bring it to my place and we can fix it together so you can get some hands on experience. Sounds like some common problems,fairly minor issues that should be easy to fix. Then it probably needs a good cleaning and wax. cosmokramer I'm unfortunately in Massachusetts but it is very nice of you to offer. I decided to buy a machine because I live in the forest and the closest on location pin to my location is almost an hour away. Ergo, none of my friends even want to make the drive to check out my purchase. I have to use the internet and fix this sucker myself. If you lack any skills like soldering or using a meter, Youtube has lots of short how to videos. Auto Launcher - check coil sleeve for dirt, wear, cracks, replace. Clean plunger. Check for loose or worn parts. Flippers - I'd rebuild and start fresh. New coil sleeve, new coil stop, new plunger assembly. Ball getting back to playfield - check for dirty or worn parts. Make sure switch in there is working. You game has a switch test - go into it and hit some switches so you learn what happens and what reports on DMD. vid1900 has a good write up here on Pinside to rebuild flippers. You can search posts on cleaning and waxing your playfield. If you order any parts, I'd add some new balls for your game too. And when you run into a problem. Don't get frustrated. Post here, pictures too if needed. And you'll likely get some help. Welcome my friend, to the wonderful world of pinball. Given that many of your coils are weak, check your voltage at the wall. ltg What is proper voltage at the coils on Striker Xtreme? 50v? As LTG says, sounds like you have some wear to the flipper / plunger mechs which cause drag and weakens flippers, ball launch, etc. Relatively easy to repair/rebuild, and will give you tremendous satisfaction. A great starting point for DIY repair is Clay Harrell's This Old Pinball DVD's. i think they are less than 10 bucks each. He has 2 dvd's that pertain to modern games (1991 and up). Spending an hour watching will help you learn a ton. I have found them to be much better than most videos on youtube. Is it possible with this machine to set 'coil pulse power' like some other machines ? 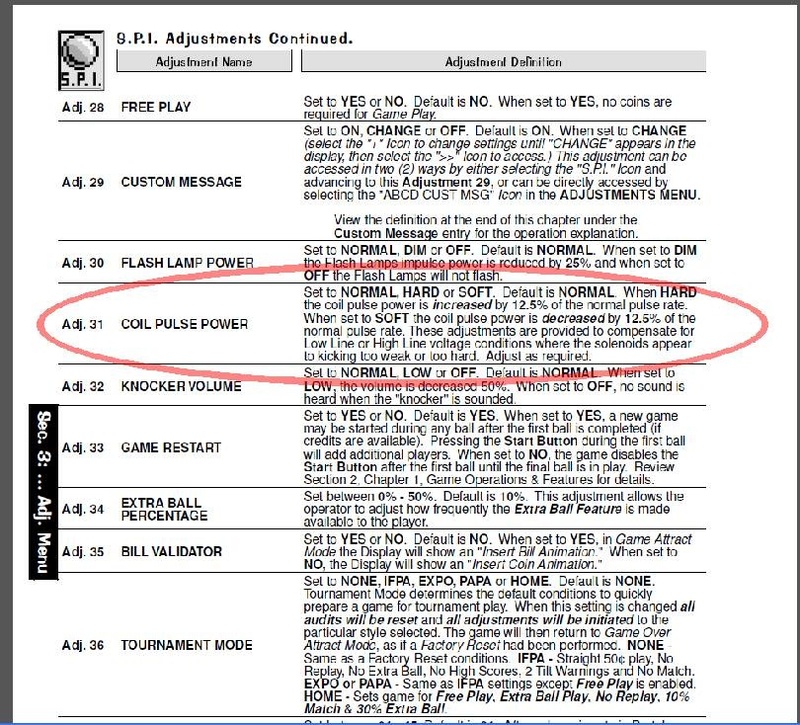 I'd check the manual, high voltage ones 50V ( might be higher not under load ) I don't know if Stern used and low power coils in that game. I'd carefully check the wall outlet AC and then check what the game is wired for. And example of wall outlet 100AC and game wired for 120AC will give you weak coils. Don't wire the game lower to make things stronger. Just try and match the voltages. ltg - is this a good flipper kit for me to use when/if necessary? zaza - I tried that to no avail. My electrical panel is 100AC. Is that the issue here? What can I do about that? Also, where issue best place to get new coils, flipper kits etc.? Thank you all very much for help, I really appreciate it. Also, just tried turning on the coil power to high, no luck. My electrical grid is 100 Amps. Is that the issue here? Huh? Do you mean your panel? That shouldn’t affect anything. You could have shot caps in ac/dc conversion or bad bridge rectifier(s). Just need to measure voltage at coils. Mushroomed plungers, dirty coil sleeves, mechs physically dragging on something .. these all can cause weaker flippers or up/out kicks. I always rebuild flippers when I get a used game out of habit. Good starting point as part of shop out, along with new rubbers and a deep clean. Auto launch could be binding on something or striking something, causing it to lose power. For example, on my sopranos it occasionally hits part of the trough switch which results in about 1/2 power. Amps and volts are very different. You MUST proceed safely when testing electrical items. You should educate yourself before further troubleshooting. You don't want to electrocute anyone (including yourself) or burn down your house. Watch some videos and you'll probably gain enough knowledge to be safe. On the auto plunger -- sometimes the shooter rod (and it's rubber piece) hold the ball up higher than it should which means the auto launcher mech doesn't hit the ball hard enough. Ran into this with my Stern Simpsons Pinball Party game. Research showed other Stern games suffer from this as well. Before you worry about voltage, I would start with the simple solution which is rebuilding the flippers, auto plunger and VUK (vertical up kicker). All 4 of these are basically the same thing. You won't find a handy VUK or Auto-plunger rebuild kit like you will for the flippers, but it's mostly the same parts. Coil stop, sleeve and plunger. My guess is that they have never been changed and are badly mushroomed causing them to be underpowered. Welcome to pinside. Where in Massachusetts are you? If you want I can face time with you to help you out with the basics . If it will help . Just shoot me a pm if your interested . nokoro I'm 90 minutes away from Bridgewater. Thanks for the welcome. brainmegaphone - You nailed it! Thats Exactly the issue. One less thing for me to fix. Thank you very much. Thanks to all who have helped out, I've learned something from everyone!